I’m finally posting about the project my friend Claire asked me to take on last fall, but because of scheduling and my brother’s wedding, I didn’t get around to starting it until late March. It was a multi-weekend project but we finished it up just in time for Easter (I told you I was behind on posts!). Claire works for our church and had this great idea for a welcome desk that meshed better with the personality of our contemporary service. So she and I talked through plans and decided that it should be about kitchen island size. So I went to my normal blog stop for plans and found Ana-White’s plans for this kitchen island. I’ve used Ana-White plans a few times before, most notably for this dining room table. I figured I could alter it a bit to make it work for us. You know, like putting in a shelf instead of the X for wine storage. (Not that I don’t like a glass of wine, but this maybe not appropriate for the church’s welcome desk). And we only really needed one drawer and no cabinet fronts, so I only used the plans really as a model for the base of the structure. 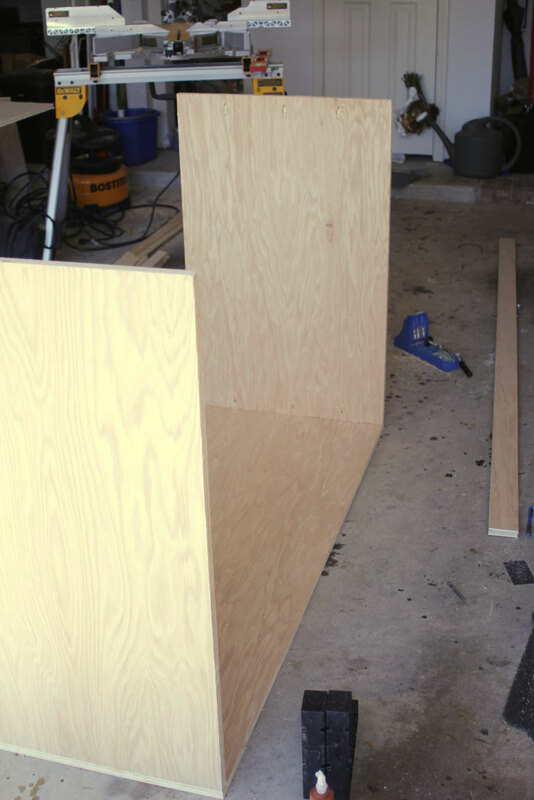 Step one is basically constructing the box out of ¾ inch plywood. We had Home Depot cut two sheets of the plywood in half vertically, and then once we got home we cut two of those halves (so one full sheet) into shelves and the dividers. 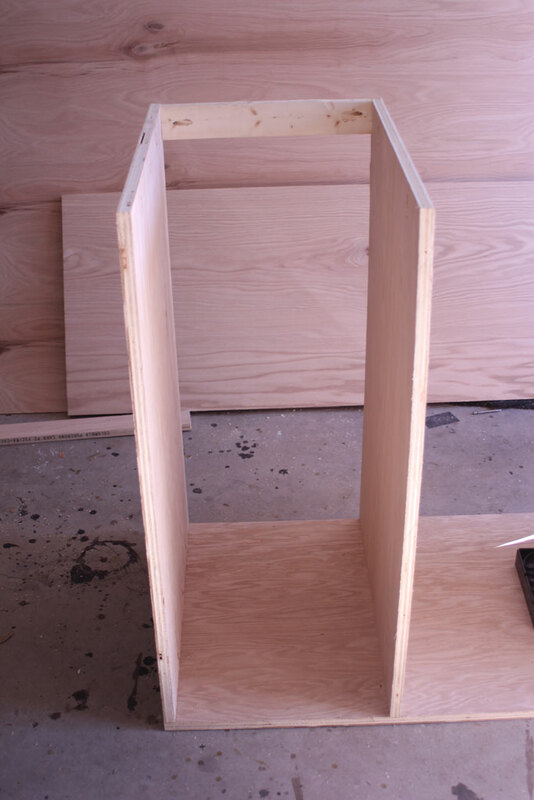 I used my kreg jig on the inside of each of the dividers to secure it to the base, being sure to go ahead and put in pocket hole locations for assembling the top whenever we got to that point. Since I was winging it, I wasn’t really sure what I was going to use as a top for the piece yet, but knew I would want to secure it from the bottom, leaving a smooth top. The next step was to add in braces between each section to give the backing something to attach to. 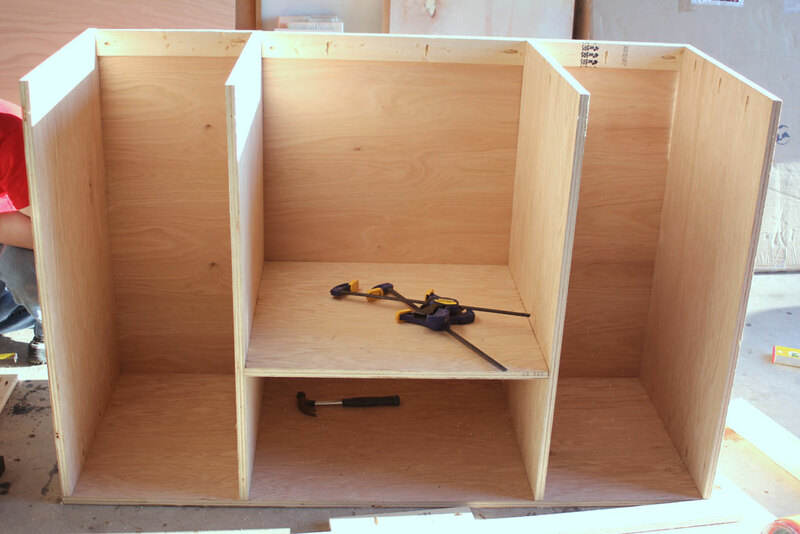 IF you are going to be adding in a drawer or drawers, be very very sure everything is square. Otherwise you may have to take apart and reassemble several times… ask me how I know. Oh and here is where I will stop giving you advice on how to put in a drawer and tell you to find other sources… mine only kind of works. And that was after reassembling 3 times. It probably won’t be the last drawer I ever attempt to build, so I’ll let you know if the next time is successful. 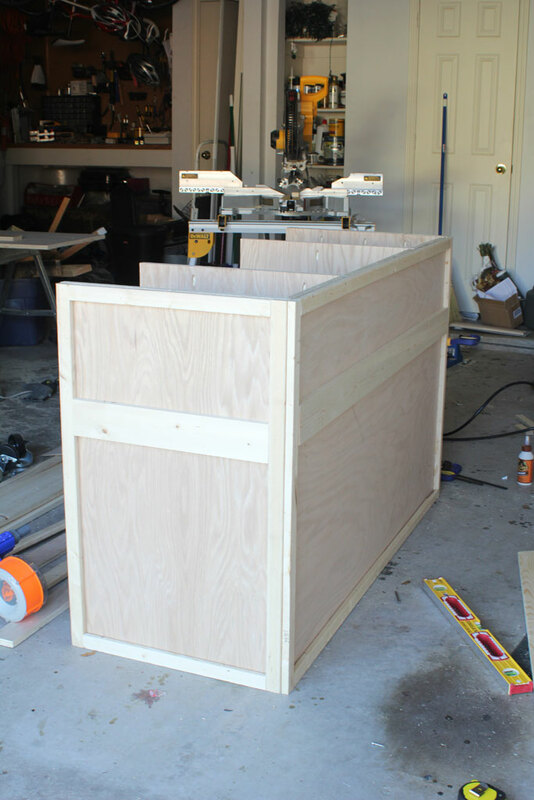 If you want more qualified instructions, I like Sandra’s tutorial about drawer assembly here. But we’re getting ahead of ourselves we aren’t ready for the drawer yet. The back (front?) 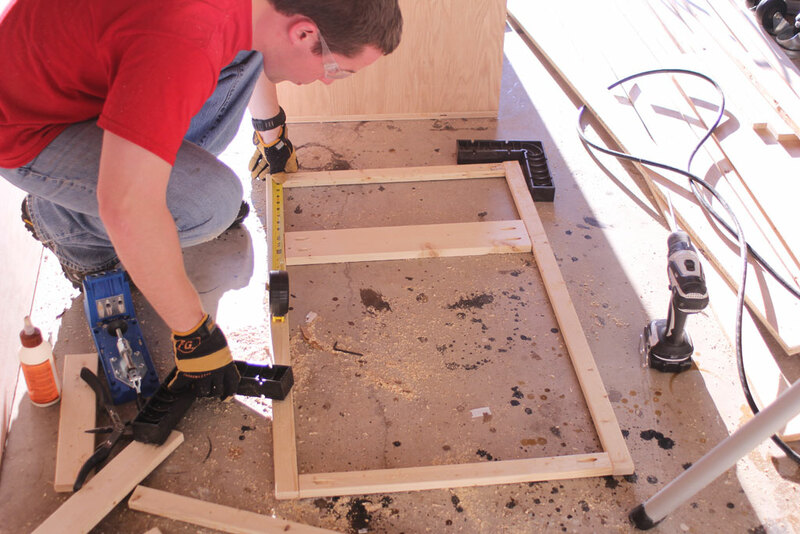 piece was a piece of ¼ plywood cut down to size and secured in using wood glue and an 18 gauge nail gun. From there we assembled face frames using 1x4s and 1x2s to create the pattern. 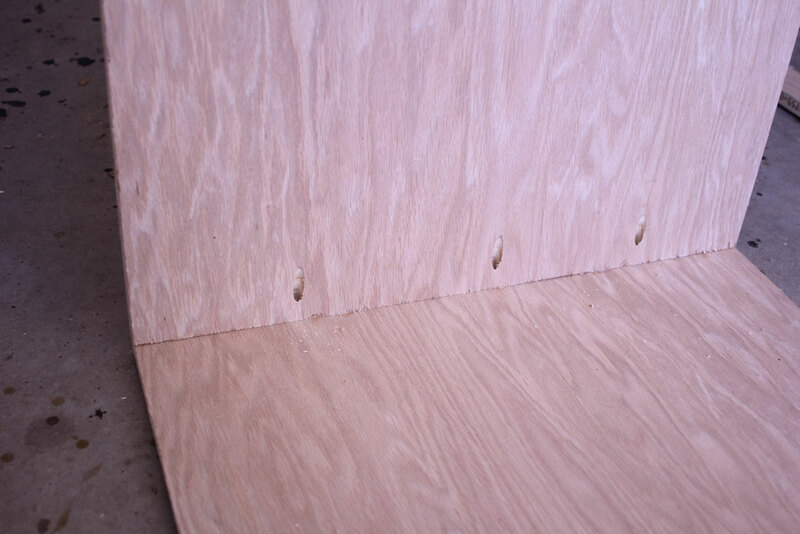 One for each side and one for on top of the ¼ plywood we’ve just attached. We did decide to add some heavy duty casters to the bottom of the piece to make it easier to roll out of Each caster has three long screws in it, since the fourth would drill up through the bottom of the piece. But we’ve moved this piece around quite a bit and they have held up very securely. Next up we cut the shelves two for each of the outer sections and one for the inner section and secured those using the kreg jig pocket holes. 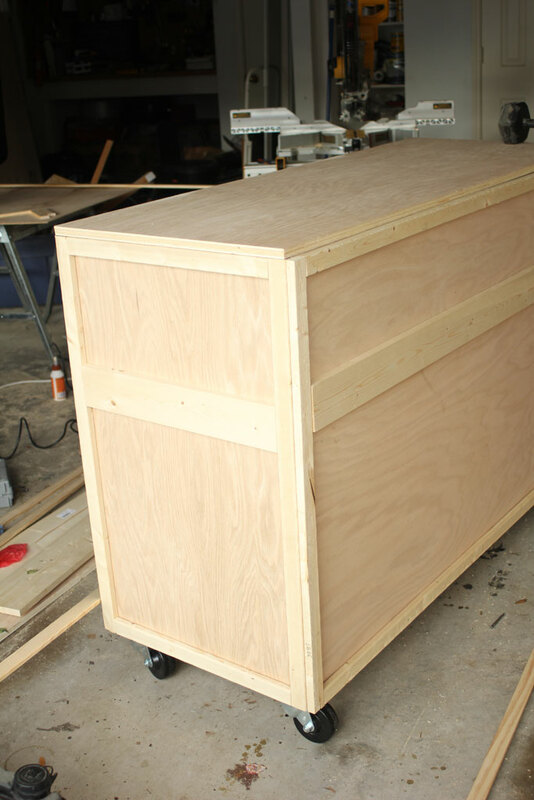 Then it was time to attach the face frame to the open side and complete the drawer. Like I mentioned earlier, I’m not going to even begin to tell you how to build a drawer because I messed it up completely, but there are lots of great bloggers out there who have successfully done this, so I highly recommend checking them out if you are adventurous enough to try it!